A group of major International artists will be making their way to Wrexham as part of the diverse and explosive “Collaborate!” exhibition, and this will be the first time much of the work has been shown outside of major international galleries, like New York’s Museum of Modern Art or The Tate. “Collaborate” is the brainchild of artists Ivan Liotchev and Nicholas John Jones. They will be working with Glyndwr’s Oriel Sycharth Gallery and Wrexham’s innovative arts organisation THIS Project, who opened the former JJB store at 11 Regent Street, as Undegun Artspace in July 2013. The ground-breaking exhibition has been put together to showcase the talents of major international artists at venues across Wrexham, while demonstrating how groups of artists and institutions can work together to produce incredible results. The exhibition is being previewed, on Wednesday, 22nd April, as part of the FOCUS Wales Music Festival, which itself brings acts from all over the world, and is just one other example of how Wrexham is increasingly being recognised as a destination for international talent. The contemporary exhibition will feature artworks and performances that use the full spectrum of the tools available in the world today – from the paints and canvasses traditionally associated with artists, all the way through to Skype. Some of the work will be controversial, but all of it will be the best examples from highly respected art world figures. Jeremy Bailey with Kristin Schaffer, Biters, Cornford & Cross, Judy Chicago, Phoebe Davis, Bernard Frize, Jesse Greenberg, Jeremy Hutchison, Helen Knowles, Ivan Liotchev, London Brain Project, Lorna Mills, Dylan Miner, Sarah Pettitt & Robert Rivers, Jonathan Powell & nu-Sangha, Kezia Pritchard & Kristofer Henriksson, Nina Rodin & Rebecca Molloy, Tim Rollins and K.O.S., Nastja Ronnko, Jesse Stead & Raphael Lyon, Ryan Trecartin, Weast, Ann Liv Young. COLLABORATE! is a survey of recent collaborative art practice. Involving 23 international artists / collaborative teams, whose work spans across media ranging from painting to Skype, the exhibition urges us to consider the wide array of forms, approaches, and results of collaboration. The central exhibition at Oriel Sycharth Gallery is presented as part of a wider programme of exhibitions, screenings and performances, in partnership with THIS Project and Focus Wales. Additional venues include THIS Project’s Undegun and Galeri 3B, and select screenings will be dispersed throughout Focus Wales events. In exploring the nature of collaboration, COLLABORATE! presents a broad variety of practices including artists who only work collaboratively, occasional collaborators, and artists who direct temporary participants or orchestrate situations. Exhibitors range in nationality and career-stage and practices presented vary from early feminism and 80s painting revival, to jazz, indigenous and post-internet art. Why do artists choose to co-create? On first thought, the merits of co-operation seem obvious and often denote harmony. We see artists like Phoebe Davis working with members of a care home as an act of empowerment. Cornford & Cross have an established practice based on mutual trust and co-operation. But are these, and other collaborative acts always symbiotic? Ryan Trecartin confronts us with post-digital discord, Jeremy Hutchison orders foreign factory workers to manufacture deliberately defective products, Ann Liv Young both compliments and insults us, Ivan Liotchev enlists hundreds of random participants in the often chaotic creation of his giant canvases, Tim Rollins and Judy Chicago urge sidelined youths and needle-workers, respectively, to raise their ambitions to High-art prominence. Are collaborative strategies mutually beneficial to artist and collaborator, or are there underlying power structures at play that verge on exploitation? Can exploitation ever be beneficial and is it even collaboration? Where does ownership lie, when often the resulting works are only credited to a single artist? What are the boundaries between collaboration, participation, orchestration and instigation? Can collaboration break these boundaries and de-centralise authority? Is it a push towards more equality and empowerment or do familiar power-structures remain? The points of conflict in this exhibition, both between the collaborators themselves and ideological questions raised, hopefully serve as means to a positive end. The tension built through collaboration may or may not resolve, but it always aims to stretch our spiritual sphere. The social strive of the exhibition stems from the networked nature of collaboration itself, displaying how snippets of individual ideas, behaviours, relationships, thoughts, patterns and visions can inform a cohesive reality. Reflecting our hyper-connected society, the exhibition, and extended partnership that supports it, can be seen as a sketch for a more united and harmonious future. Most artists in this exhibition have shown internationally, but never in Wales before. COLLABORATE! brings for the first time to Wales the groundbreaking participatory works of Tim Rollins and K.O.S. as well as Judy Chicago’s seminal Birth Project. Other artists showing in Wales for the first time include performance artist Ann Liv Young, Métis artist Dylan Miner, and Japanese duo WEAST. A special feature of the exhibition will be the first ever presentation in Wales of Ryan Trecartin’s ambitious 3-channel movie Comma Boat. A unique vision of dictatorship, yet emblematic of Trecartin’s hyper-collaborative style, the large-scale installation will be presented at Undegun in Wrexham city centre. The main exhibition launch at Oriel Sycharth Gallery will be on 23 April, 6-8pm, and will feature a live, multi-actor performance directed by Helen Knowles. 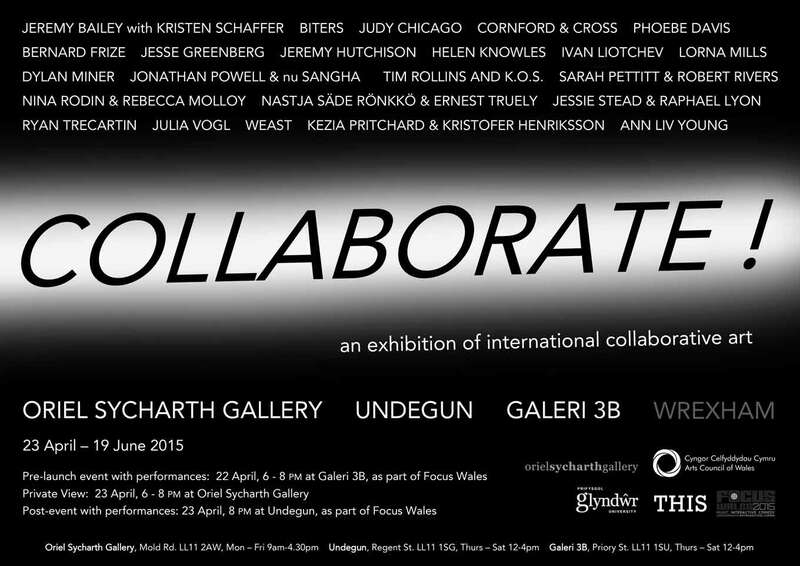 A post-event reception with performances will follow at Undegun from 8pm onwards. As part of Focus Wales’s regular programme, the post-event is ticketed, but visitors to the opening at Oriel Sycharth will receive free passes to a special VIP zone.